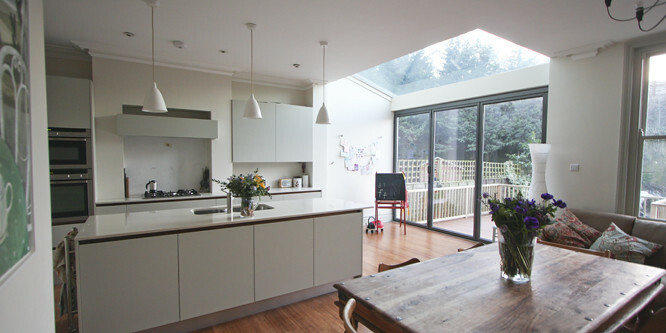 This post is sponsored by VELUX® and is a good excuse for me to share a little insight into our house renovation. When I started this blog I thought it would be a great place to document our home renovation which had just started but somehow that didn't happen. 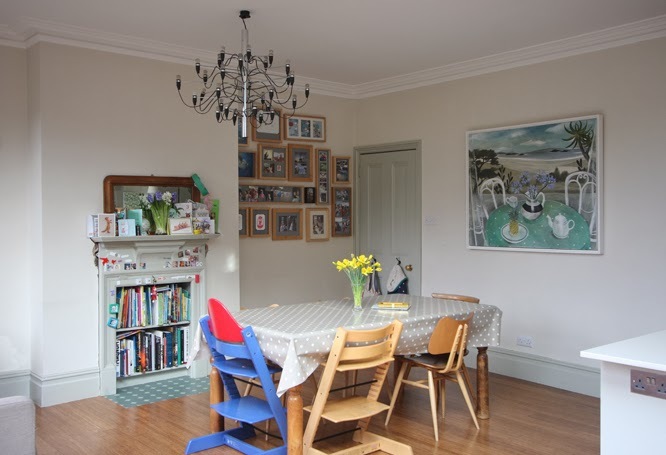 Most of the things we were doing were not actually very photogenic, as much as I wanted to think about paint colours, beautiful fabrics and furniture we were actually spending a lot of time sorting out the bare bones of the house. It was a steep learning curve. Our evenings shifted from sitting on the sofa tutting at the people going over budget on grand designs to researching heating systems and studying wiring plans. We'd veer from feeling really positive about what a great house we were going to have to being completely depressed about the mountain we had to climb to get there. 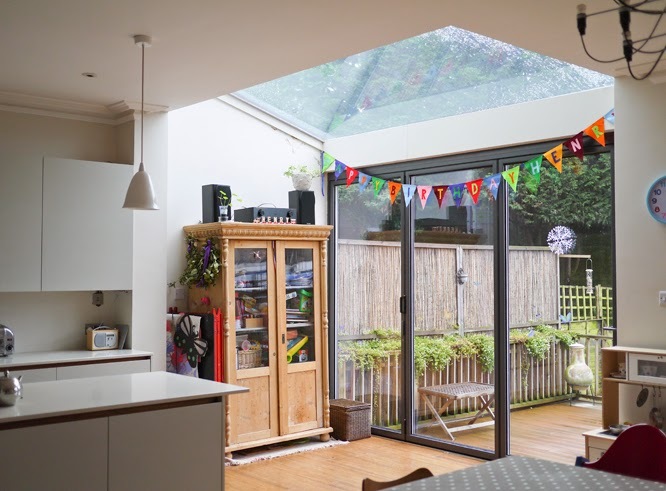 Replacing all the windows in the house with new double glazed sashes was one of our big budget items and we also wanted to make our spaces as light and bright as possible so we'd be looking at online resources like the VELUX webshop to get prices and inspiration. There are still various projects we need to complete around the house and one thing we've been toying with installing is a VELUX Sun Tunnel - our friend - who was also was our amazing project manager when it came to our major works - has just installed one at his house for an ensuite bath room. 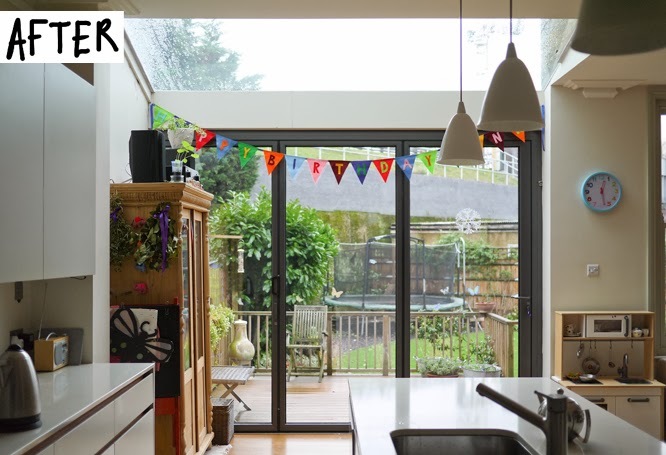 It is such a fantastic way of bringing light into an otherwise dark space. 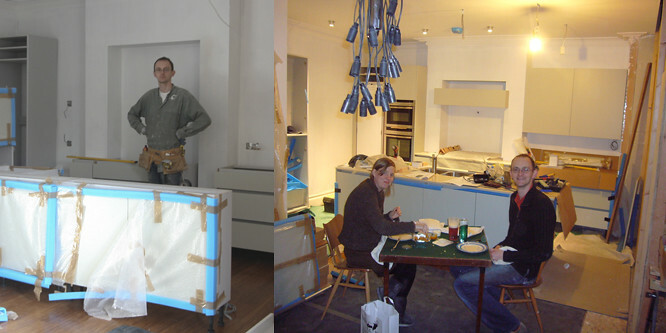 The biggest impact we've had on this house is in what is now our kitchen... and now finally, five years on from when our 'before' photo was taken I think I can show our complete journey. 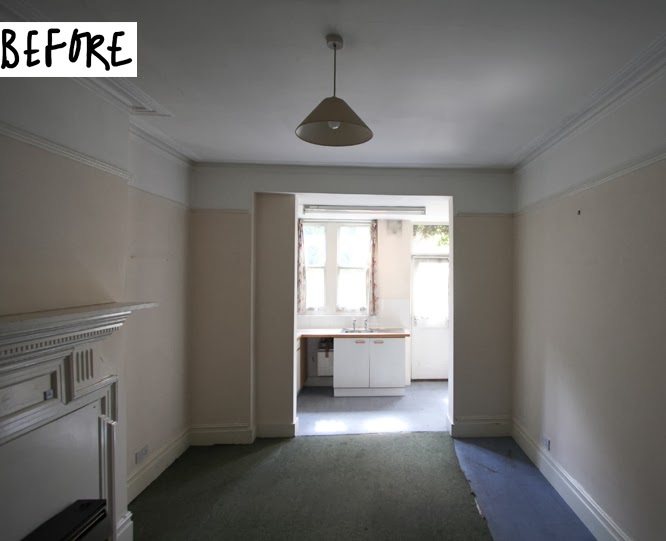 Two rooms that were just begging to be one. 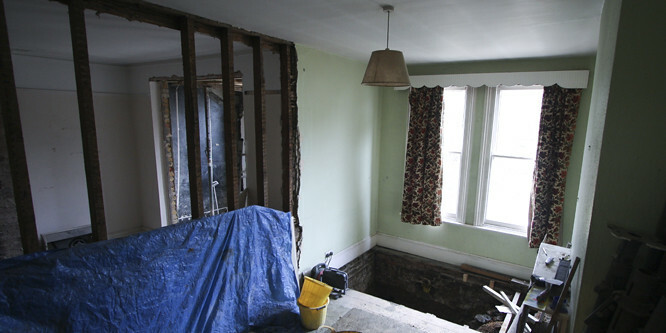 You can just spot the fireplace that is now in our sitting room there on the bottom left of this photo. Note the lovely lino/carpet combination. Not sure what that was about... and quite a lot of ivy trying to grow over the doors and windows. The room on the left which is now the room that we were converting into our kitchen and family room felt seriously dark. 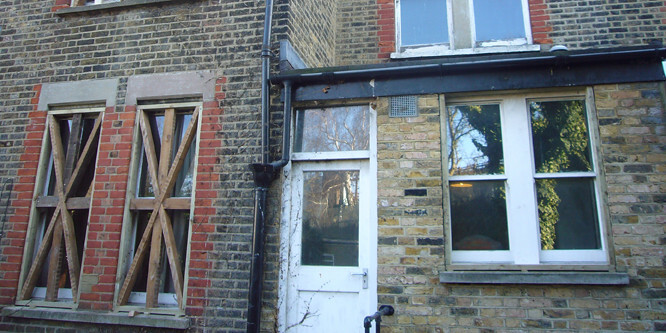 It's hard to imagine as it's not dark now but a combination of mean windows, an overgrown garden and winter light created a dingy space that was pretty depressing. We lived in the house for a few months before we started major works. Coco was nearly two (in fact we had her second birthday 'party' in this room) and we had no central heating... we managed to stay until the beginning of December before we crumbled. 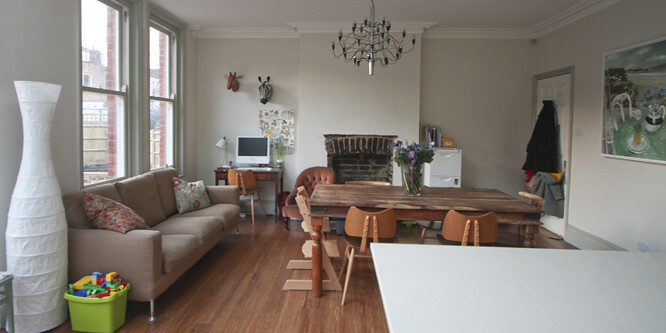 We used this room as our kitchen/sitting room at the time as it had a working gas fire. It kind of felt a bit like camping. Probably because we were using a calor gas stove to do all our cooking on. I know, we were living in chaos. 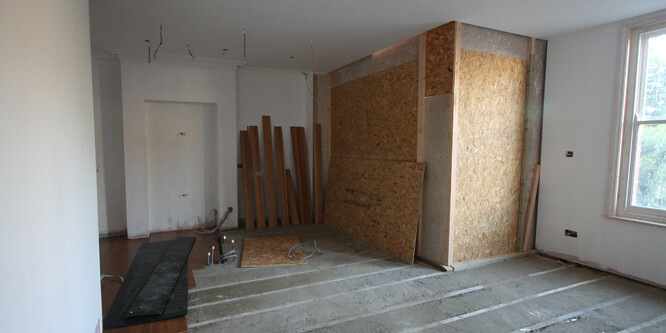 Once we moved out and the work started walls and floors quickly disappeared. Yep, that's me testing paint colours - ever the 'useful' helper! And really practical clothing... hmmm. 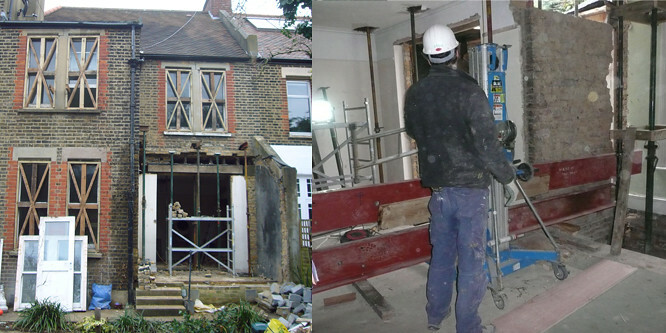 And the photo on the right shows the huge steels that are now holding the rest of the house up. 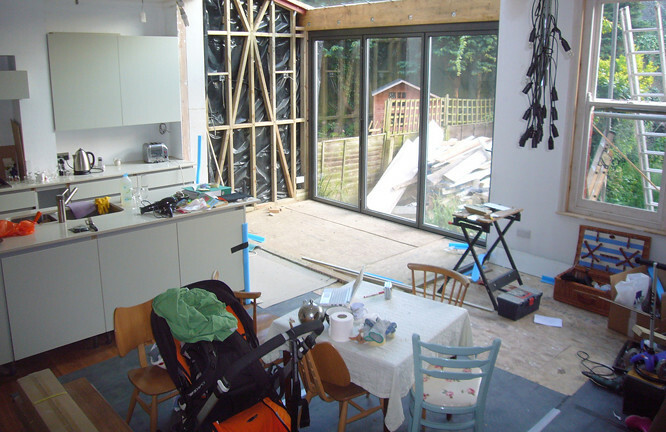 Before the glass roof and doors had arrived - underfloor heating and bamboo floor being installed. 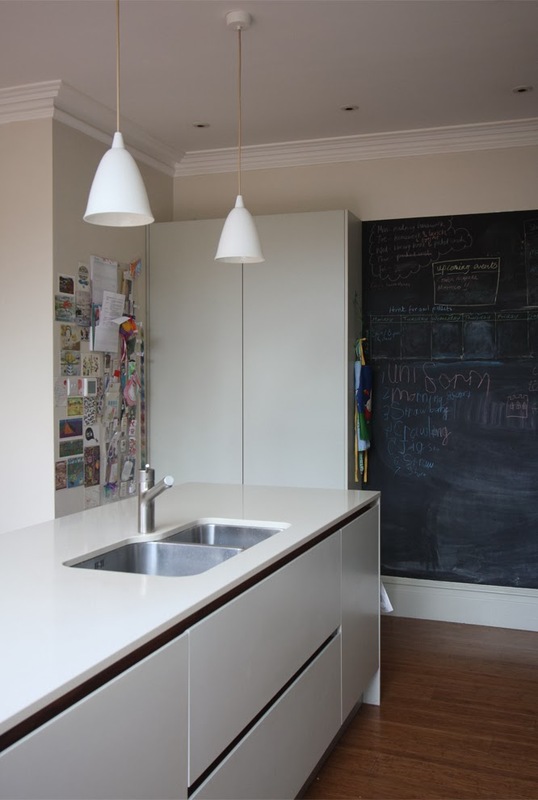 Hugh fitted the kitchen, we had to move back in before it was all finished (so predictable!) this is us having a curry on our first night back in the house. Election day 2011, we came back to vote. We'd just had a weekend away, camping in Derbyshire, we'd all got colds and then I'd found out I was pregnant. Quite a week. 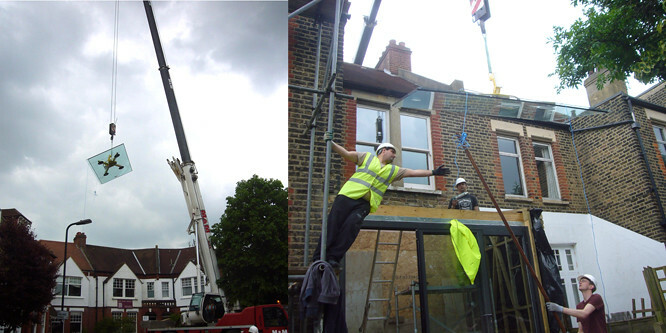 The glass roof arrived... it had to be craned over the house. A stressful day for all. ...and then we just carried on living in semi-chaos while the floor and walls were finished around us. 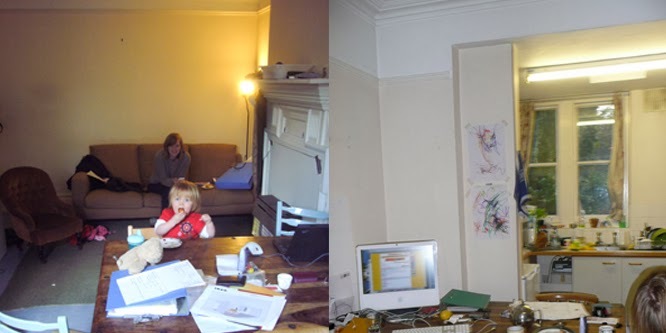 We did get things done gradually and by the time Henry arrived nine months later the room looked like this (although of course not normally quite this tidy). We lived with just the kitchen finished for about a year and then we had another push and got the sitting room done in time for Henry's first Christmas 11 months later. Quite a bit of tweaking... and a lot more clutter! 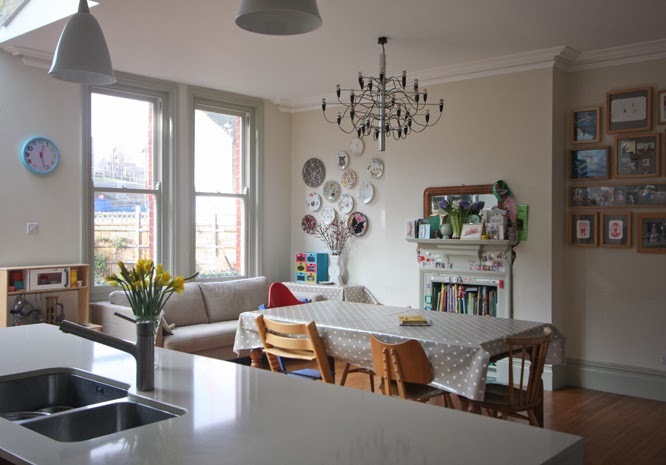 I tidied up for you and took some photos last week... (and reminded myself just how hard it is to get decent interior photos). What an amazing transformation. 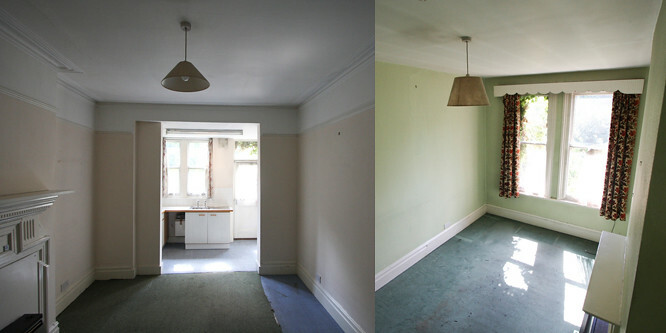 We moved into our house 14 years ago nearly and then spent the next four or five years doing it up. As you can probably guess it it about time we had another go at it; ten years and four growing children has done some damage... Very inspiring photos - enjoy it! 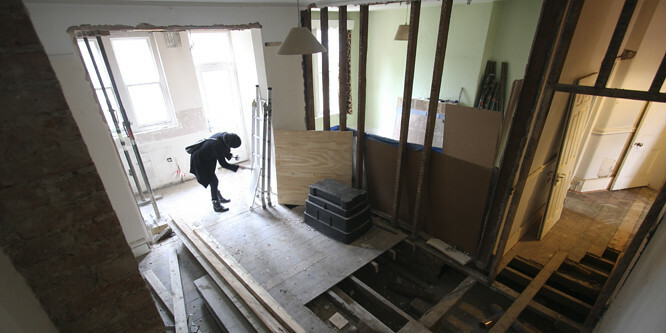 Our house renovation has been quite a long haul - I remember saying to a friend when we moved in that I expected it to take about five years to finish... we're just about to reach the five year anniversary and we are nearly there - still lots of things I'd like to do though. 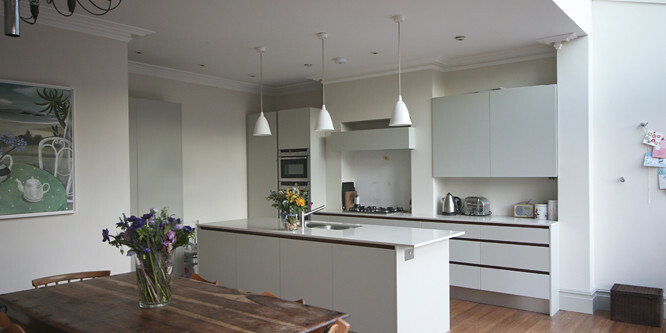 The kitchen envy i have right now is out of control! 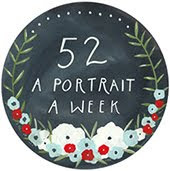 Thank you - I'm a bit obsessed with pretty plates and china, my weakness! 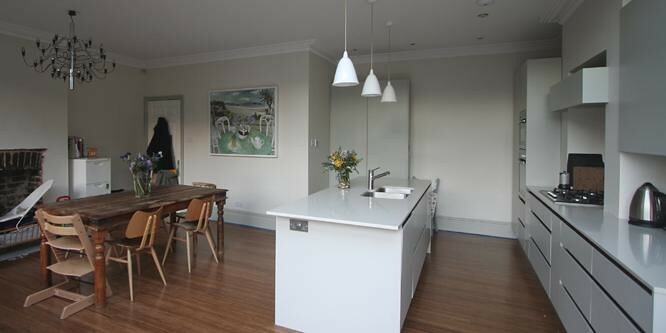 Hi Charlotte - we hired our friend who is an architect to do the plans and another friend was our building project manager - both were pretty invaluable and helped us to really get what we wanted from the room - we pretty much planned the kitchen (units) ourselves; but that was the fun bit. Oh - what a shame! I wish we had managed to hang out more now... was literally just reading about your Parisian adventures... makes me want to go! Maybe we'll have to come to your neck of the woods instead (in my dreams, SO not about to happen). Thanks Lia - you're comment on IG really made me LOL! 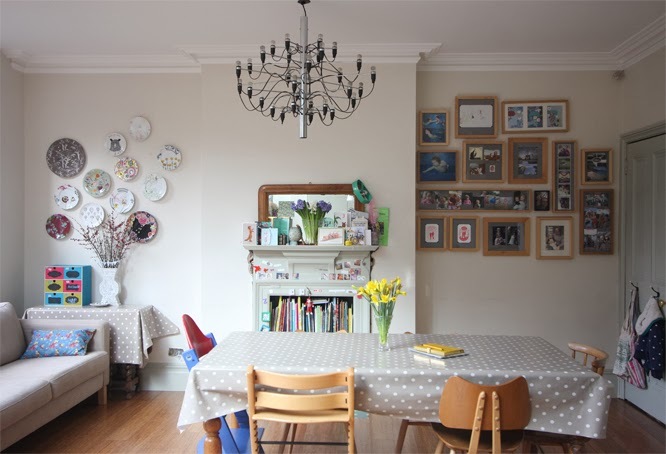 Fab post, I still prefer the room when it has that lived in look... OK you might say mess! I love the way you use this room it is a great place to be, however many people are in it and whatever time of day or year.